Apprenticeships are a fantastic way to boost a business’s performance and increase the skilled workforce. The government fully supports employers who decide to take on an apprenticeship, with the offer of a £1000 incentive, subject to certain conditions. The Government has realised that there is an ongoing national skills shortage and understand that apprenticeships are a very viable option to help fill this skills gap, as well as helping employers expand their business. Thanks to the 2015 launch of degree apprenticeships, where learners can now achieve level 6 and 7 qualifications, the number of people seeking an apprenticeship instead of pursuing higher education has drastically increased. To aid employers in catering for this rise in apprenticeship applications, the government offer different levels of funding, as well as a £1000 incentive for employers. 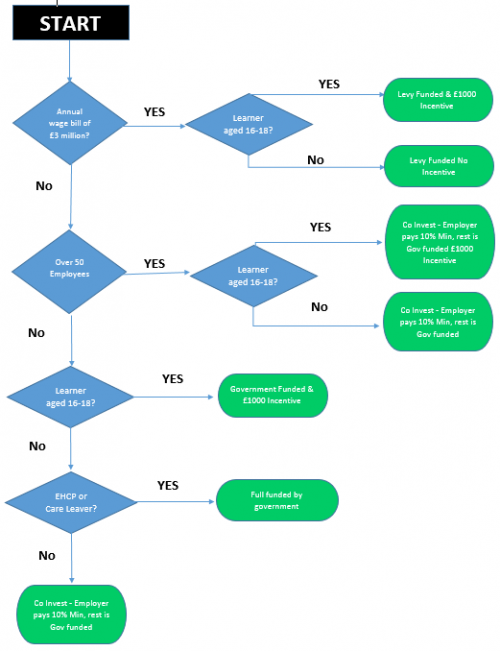 There are different levels of funding available to levy and non-levy employers. Being a levy employer means having a wage bill of more than £3million. If you are a non-levy employer, you only pay 5% of the total cost of training, and the government funds the remaining 95%. If you are a levy employer, 0.5% of your paybill is ring-fenced for training. The government will add an extra 10% to the pot if you decide to take on an apprentice. Small employers with less than 50 employees do not need to pay anything towards the training of a 16-18 year old apprentice, as the government will cover the cost 100%. You will still have to pay their wage though! There is also the fantastic promise of a bonus payment of £1000. A 16-18 year old apprentice requires a higher level of supervision and pastoral care, so you will receive an additional payment of £1000 to help cover these costs. This is paid to you by the training provider. Aspire Training Team offers bespoke apprenticeships in Childcare, Business Administration, Customer Service, and Leadership & Management where we match the young person to the employer. There is no day release involved – apprentices access their training by working through online modules. They also have the support of their assessor, who visits them regularly in the workplace. Contact us to find out more about the services Aspire Training Team can offer and how you could benefit from taking on an apprentice.